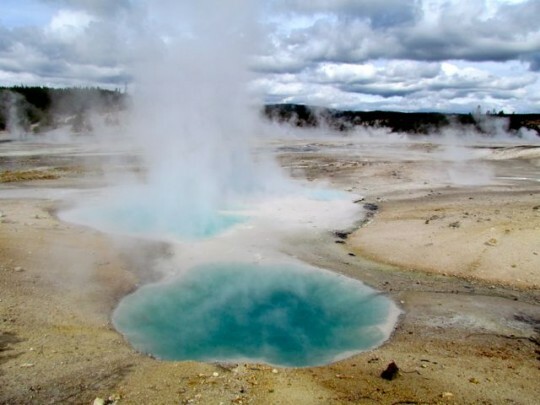 We arrived in Yellowstone National Park with the intention of spending about three days. Eight days later, we weren’t quite ready to leave. However, the government sent us on our way when they shut the gates to the park on October 1st. 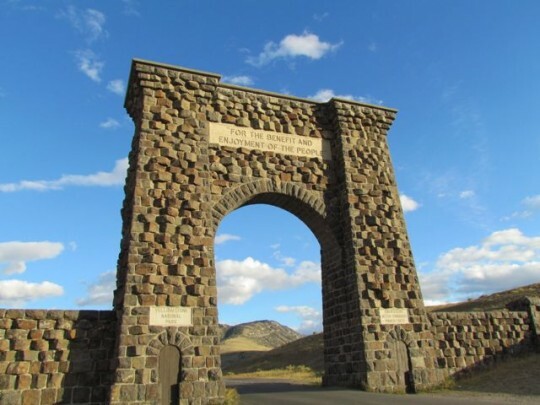 According to the stone arch that we drove through every day to enter the park, Yellowstone was created “For the benefit and enjoyment of the people.” But we won’t dwell on the insane shenanigans of our government officials here. Instead, we’re going to focus on how absolutely spectacular Yellowstone is, and we’re going to do our best to share our experience with you. Which is impossible. I just want to say at the outset that trying to capture Yellowstone in photographs is challenging, to say the least. There’s just so much that doesn’t fit into the photo frame. Nothing quite prepares one for the vastness that is Yellowstone. And the diversity of landscape. And the wildlife. And the crazy weather. 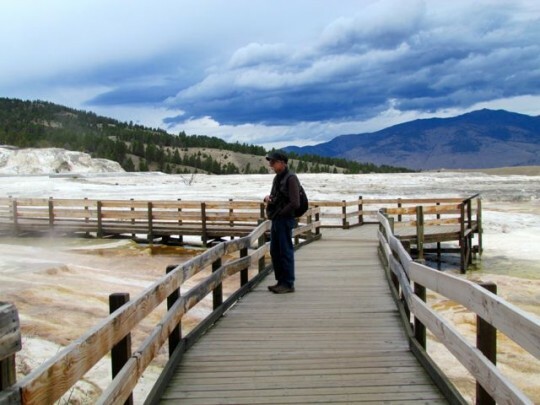 We learned that we definitely could not trust the weather forecasts for Yellowstone. They are always wrong. It’s not their fault. Yellowstone is just not to be tamed. We experienced rain, sun, snow, sleet, hail, and torrential winds, sometimes all in one day. But we decided to not let any of it stop us. The main park road is laid out somewhat like a figure eight, with a main entrance at the north (near the town of Gardiner, Montana) and another main entrance at the west (near the town of West Yellowstone, Montana). We started our adventure at the north entrance, choosing to stay in an RV park in Gardiner because a snowstorm was forecast, and we didn’t want to be stuck in a park campground with no electricity or water. It was a good decision. 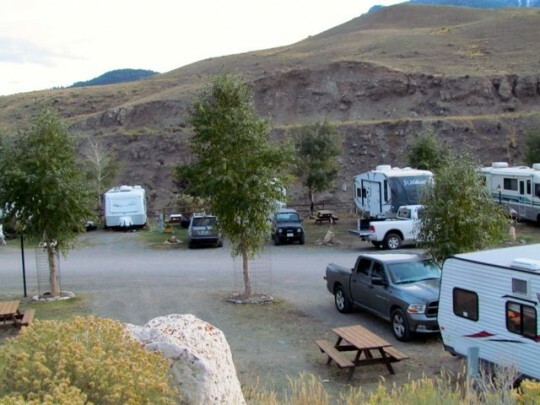 The nearest campground in the park (Mammoth) was crowded and sandwiched between two busy roads. 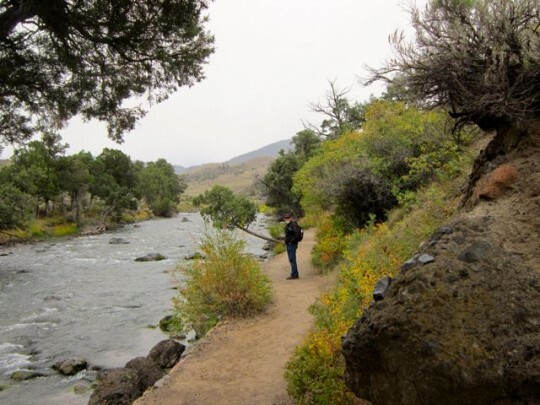 In contrast, our RV park campsite was right on the river, peaceful, and convenient. We ended up staying six nights, extending our stay every afternoon when we returned from exploring and realized that we weren’t done yet. After setting up camp, we took off for our first exploration of Yellowstone. The helpful volunteers at the Yellowstone Information Center in Gardiner advised us to drive the Lamar Valley before the impending snowstorm. 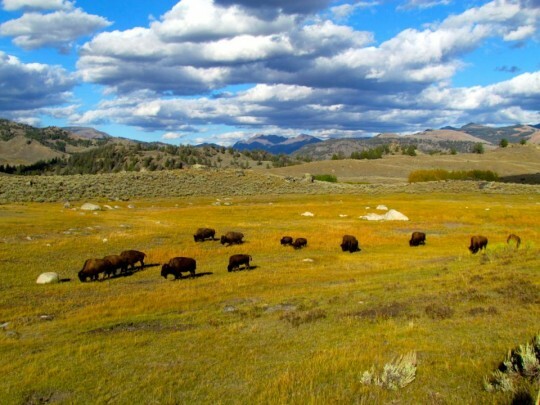 The Lamar Valley is known for wildlife sightings: We put bison, elk, pronghorn, grizzly bears, and wolves on our wish list. Heeding the advice of the rangers, we also bought an enormous canister of bear spray. And we were tutored in exactly how to use it: If a bear makes a threatening move, aim the spray toward the ground and give the bear a warning blast (make sure you’re not downwind of the spray). If the bear keeps coming, unleash the remainder of the pepper spray into his face. Other instructions—don’t run, and don’t scream. Which is exactly the opposite of what every cell of your being is programmed to do. Things have changed dramatically in Yellowstone since the last time I visited. It was 1961, I was 7 years old, and our family was on a cross-country road trip in our VW bug. My most vivid memory from that trip is of feeding the bears from our car. The rangers at that time displayed a laissez-faire attitude toward the interaction of people and wildlife. But at some point in the ensuing decades, it became obvious that feeding the bears wasn’t such a great idea. I think it was when the bears figured out that they could just break into cars and tents and take whatever they wanted. Since that time, grizzly bears have also made a comeback in Yellowstone. That, combined with stories of more aggressive black bear behavior, and the fact that fall is the time when bears are ravenously foraging for food before they go into hibernation, encouraged us to fork over $45 for the bear spray. The entire time we were in Yellowstone, we didn’t leave the truck without Eric strapping on the big red canister of bear spray (the rangers cautioned us to wear the canister at all times on a belt or shoulder harness). We also talked and sang on every hike, because bears don’t like to be surprised. I like to converse while we’re hiking, admiring the beauty of the landscape, naming the plants, spotting birds and animals along the way. But it was exhausting even for me to keep up constant chatter. As for Eric, after a hike to Beaver Ponds just above the Mammoth area (where bears had been spotted and so we talked and sang the entire way), I told him he talked more on that hike than in 16 years of our previous hiking together. We decided then that we weren’t doing any more hiking in forested areas where we couldn’t see what was around us. 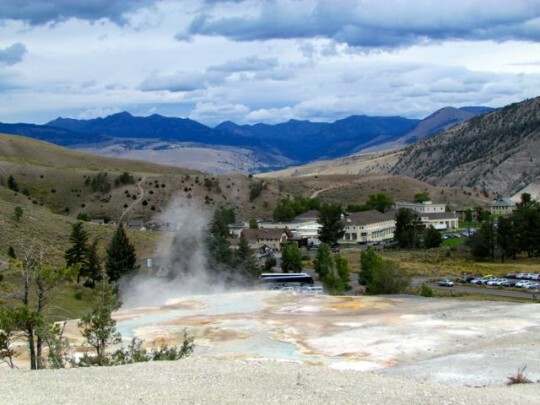 Day 2: Mammoth Hot Springs is just a few miles inside the north entrance to Yellowstone. 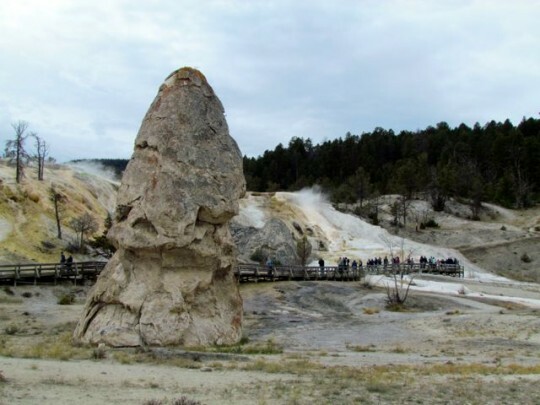 It’s a 300-foot brilliant white travertine mound, encircled in clouds of steam from the various pools that cascade down the sides. A couple of miles of boardwalks, connected by steep stairs, meander around the pools. We walked the boardwalks, enjoying the cascading springs and the views from high above of the lodge below. 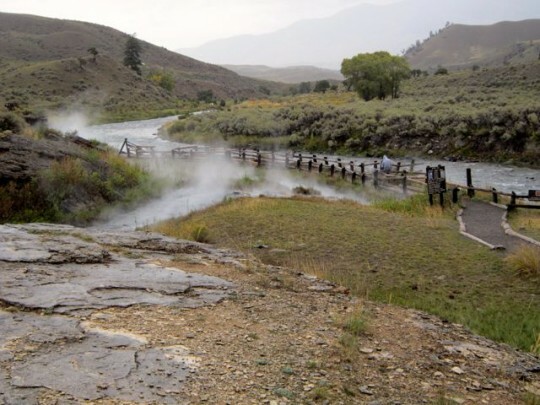 Late in the afternoon, we hiked a half-mile trail in heavy fog to soak in natural hot pools, at the sweet spot where the Boiling River meets the ice-cold Gardiner River (just inside the park boundary). We lucked out in that most people were apparently deterred by the weather, and there was only one other couple at the pools. Wading about 50-feet over slippery rocks in the knee-deep, swirling, freezing river to reach the hot pools was challenging, but soaking in the pools, mist rising around us, was magical. Day 3: Stormy and cold! 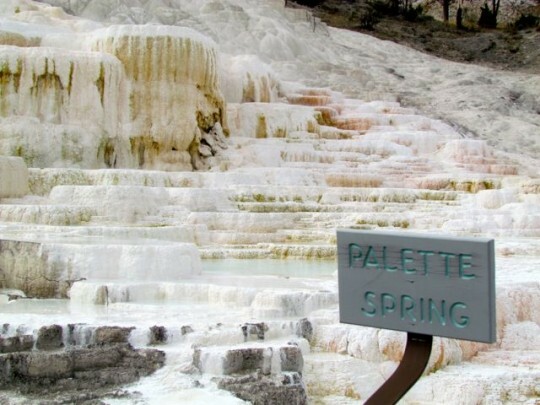 In the afternoon it cleared enough for us to hike the Beaver Ponds trail, a 5-mile hike above Mammoth Hot Springs. This was the hike that convinced us we weren’t going to hike any more trails at Yellowstone that involved densely forested areas (and potential encounters with bears). A better plan is to just not think about the fact that you’re walking above an active volcano. 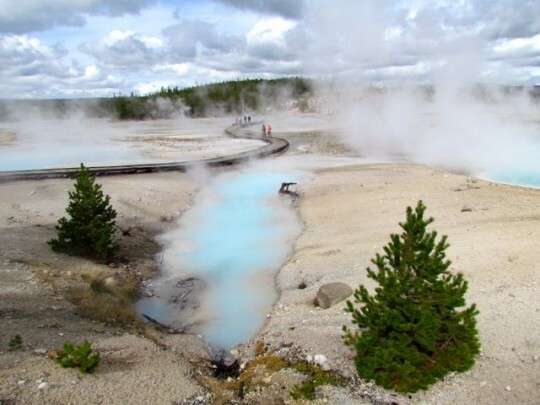 Norris Geyser Basin was our favorite of the geyser areas—dozens of varied hot pools, geysers, mud pots, and steam vents; all simultaneously bubbling, gurgling, popping and whistling. 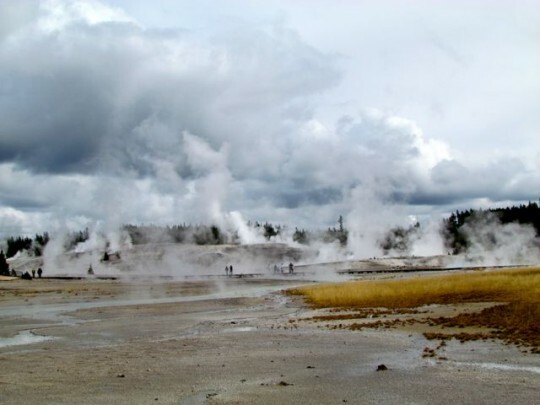 Great clouds of sulfurous steam surrounded us as we walked the couple of miles of boardwalks. It was like strolling through a beautiful version of hell.